Old crane at Platico Point Beach, Middle Caicos. 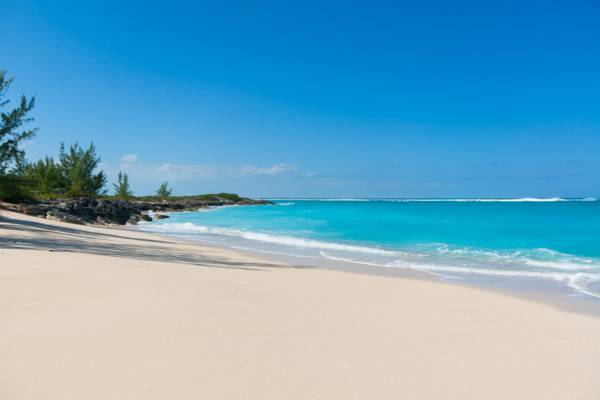 This small and secluded beach is a nice stop on Middle Caicos. Some may find the abandoned equipment interesting. Platico Point Beach, Middle Caicos. 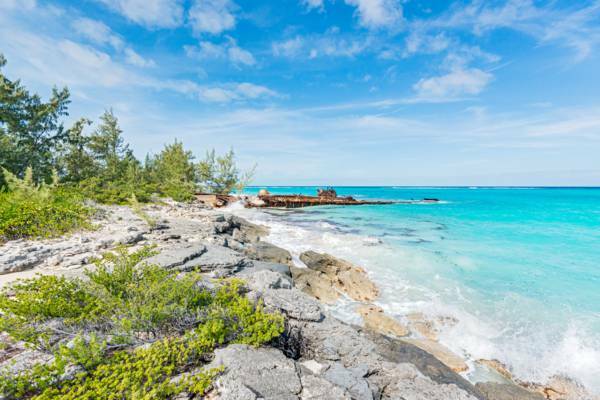 This small stretch of coastline is found between the settlements of Conch Bar and Bambarra on Middle Caicos. The low marine limestone cliff coastline of Nongatown Landing continues from the east side of this beach. A quite nice albeit small beach is located at the point. The Conch Bar Coastal Road leads to Platico Point and is well worth the drive. The coasts in Platico Point area of Middle Caicos can be quite good for shell beach combing. Due to the adjacent barrier reef and typical ocean swell, cowries, tritons and conchs can often be found. The barge wreck at Platico Point. The rusted and heavily decayed remains of a crane, barge, tanks and containers can be seen at Platico Point. This equipment was part of a failed cargo port project. This collapsing equipment can be dangerous, and should be avoided. The name is believed to have Spanish origins. Platico translates as 'I chat/speak' in Spanish (from the infinitive verb platicar), but also exists as the diminutive form (to denote smallness) in Cuban Spanish for 'plate'. Certain diminutive word endings in Cuban Spanish use -ico/-ica instead of -ito/-ita in Castilian Spanish (in this case platico instead of platito). The easiest and best access to Platico Point Beach. Last reviewed by an editor on 26 May 2016.